You can access a full list of all of the training blocks that have been applied to an athlete using the Started Training Blocks Button (on the Training Blocks Module), or by viewing an athlete's calendar in the Calendar Module. 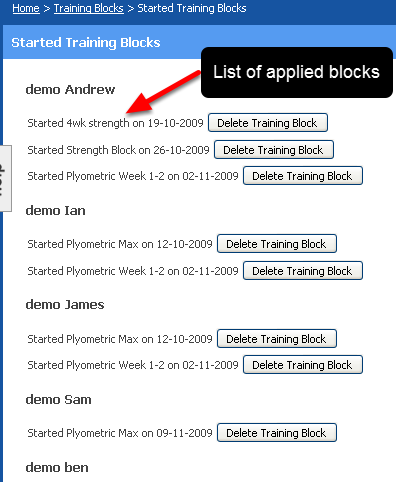 To see which plans are applied to which athlete, go to the Training Blocks Page and click "View Started Training Blocks. A complete list of plans by athlete will appear (as shown here). If you click on the "Delete Training Block", the training block will be removed from the athlete's list and all draft (planned) sessions will be deleted. You can Delete an applied training block by clicking on "Delete Training Block". 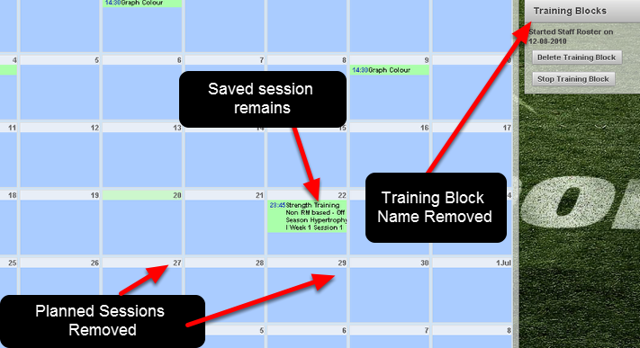 All sessions that have been opened schedule and "Saved" by the athlete/coach won't be deleted from the system. Any sessions that are scheduled (saved as a "Draft") will be removed from the system. This include all historical and all future sessions for that training block. If you click on the "Stop Training Block", the training block will be removed from the athlete's list and all future planned sessions will be deleted. You can Stop an applied training block by clicking on "Stop Training Block". 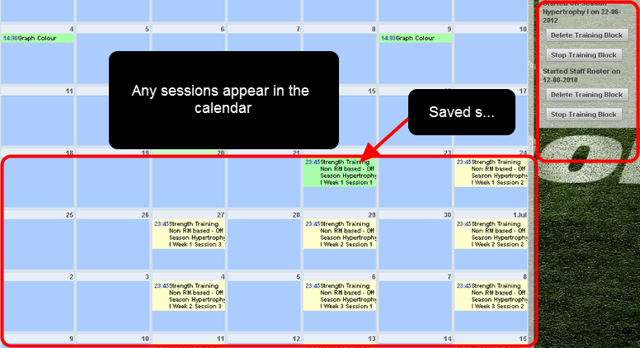 All sessions that have been opened schedule and "Saved" by the athlete/coach won't be deleted from the system. Any FUTURE sessions that are scheduled (saved as a "Draft") will be removed from the system. Select the athlete that you want to view, then any plans will be displayed on the right of the page in the "Training Blocks" Box. The athlete's calendar displays the actual sessions in orange as they are "planned" and when a user mouses over the name of the session, it is easy to see that the session is the first day of the first week. 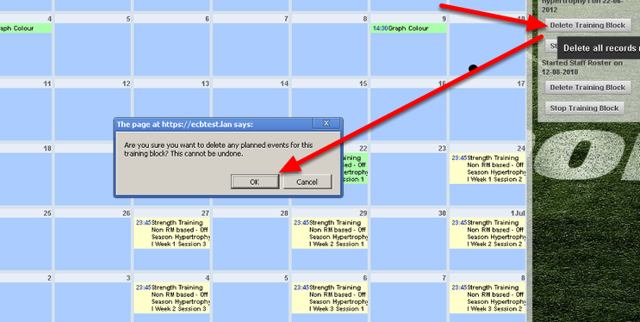 When a user wants to enter in that the session was completed they simply open the event and click save and close and the event will turn green on the calendar. If you click on "Delete Training Block" on the Calendar Page, all sessions that are schedule as planned sessions (that have not been opened and saved) will be removed. This example shows that we are going to delete the Hypertrophy Training Block. Only one of the sessions has been opened and saved all of the draft (orange) sessions will be deleted. The image below shows the Calendar once the training block has been removed. The image in the step below outlines what happens when a training block is stopped.